Every Captain Marvel needs a sidekick! 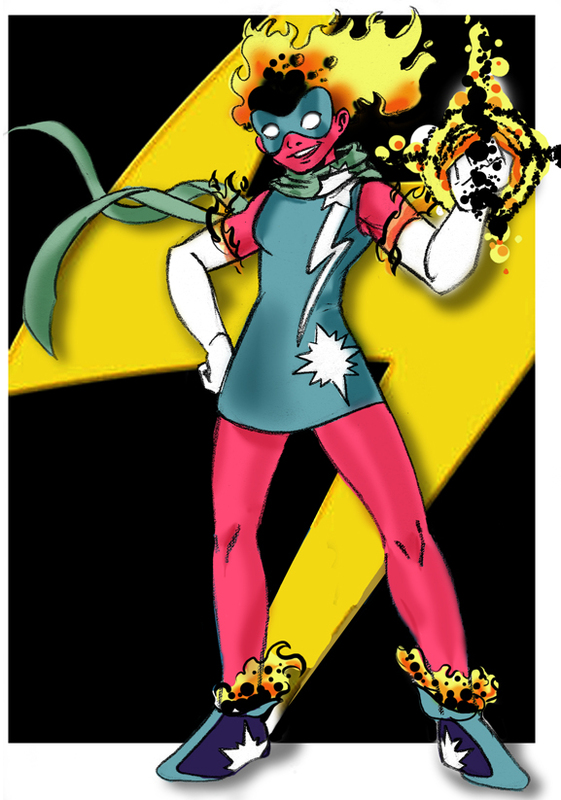 A long time ago, I joined an art contest modeled after Project Runway, but this time with superheroes! Here was my entry for the challenge to take a current superhero and give him/her a sidekick. The result was Binary Mary! As you may remember, Captain Marvel was once known as Ms. Marvel and even at one point had the code-name Binary. I took that moniker for inspiration, along with the idea that another Captain Marvel had a sidekick named Mary, and ended up with Binary Mary. I probably would go with a different design if I had to re-do it now, but I still love the color combo! Vera! So good of you to come! As long as one has want of me, I am his-or-hers completely. Darling, I’m positively shameless. Chris Sims gets things right a lot of the time. There, Chris. I’ll give you that one for free. Blurb away! Be sure to quote Vera Maven copyright 2014. A thing is never a problem when my own opinion is the solution. I have a marvelous and unapologetic subjectivity. And thus I willingly offer my own ideas “how to get in there and fix it,” as he says. Mr. Sims points out that Wonder Woman — well, that she’s a Disney princess, or in his words “quite literally a magical princess that can talk to animals.” Well, on the face of it, why not? She’s a gutsy adventurous heroine with magical powers from a faraway land who wants to see the world. Simsy is right, why WOULDN’T this work? The problem is, that only really works for ONE movie or story, which, as he admits, is prima face an origin story, with Wonder Woman NOT YET grown-up. I mean, of course Disney Princesses are usually pretty young, because they are by nature in the middle of their process of growing up. For another, Disney Princesses usually have the whole becoming a princess thing as the END RESULT of their heroic journey, and that’s even for those who start the movie as a princess in the first place. But for the essence of Wonder Woman– the essence, mind you– it’s more confusing. Does her “story” start BEFORE or AFTER her arrival to Earth from her magical island? If her story starts BEFORE, then OK, sure. You can have her do her whole heroic journey thing like any Disney Princess– she can sing her “I Want” song, she can have some sidekicks help her realize her special place in the world, and she can overcome the villain who tries to be selfish. And then, Diana is awarded magical gifts and becomes Wonder Woman, a warrior and emissary to Outside World, and … then what? Her story, essentially, stops. Because for her story AFTER her arrival, well, frankly, Wonder Woman is really just Generic Superhero #5: Paragon. “We want a superhero, but, you know, like a girl,” said someone, somewhere. Which is fine if you are a character yourself, like bystander in the comicbook world, looking up and seeing a hero punch a villain in the face. But when you want to follow that hero *as a reader,* outside that story, you need to know what she does AFTER, like where does she go home at night, how does she pay for her latte, what happens in-between punching the next villain in the face? You know, superhero tropes and all of that. Which is a shame, because there are SO many possibilities for the stories AFTER her arrival. Just do the math. How many stories can take place BEFORE her arrival? One! Her origin. (Yes, yes, I’m sure you can have all kinds of TV shows with young Diana as Wonder Girl before she arrives on Earth, but these are arguably “spin-offs” of what everyone would consider the ONE story.) But how many could you have AFTER? It’s limitedness, darling! So forget the analogy of Wonder Woman as a Disney Princess story. What you REALLY have, and what is SO MUCH better, is that Wonder Woman is a James Bond story. Think about it– who really cares about James Bond’s origins? He’s an archetypical pulp action hero in the modern day– you don’t NEED to know any of that origin stuff to make an entertaining overcome-the-world-dominating-criminal-mastermind James Bond story. 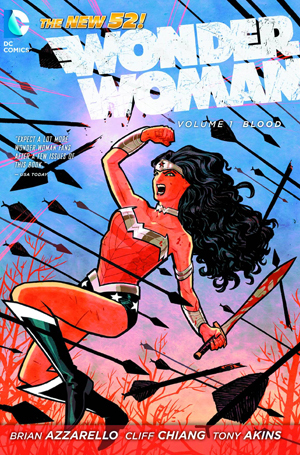 Nor do you need any part of that for a Wonder Woman story… the backdrop can be any mix of the Percy Jackson, Xena, Thor, the Little Mermaid, or whatever-you-like as long as it gives us an overcome-the-world-dominating-supervillain kind of story. Wait a second, Vera. Isn’t James Bond, for all his iconic status and permanent place as cultural touchstone, really just Generic Superspy #1: Maverick? He’s got his own formula of tropes that make the actual character, as-a-character, kind of superfluous. Just like the problem of Wonder Woman! Too true, darling! Wonder Woman exists as this very strange property– a cultural touchstone that is more powerful as an idea than as an actual story, like beginning-middle-end kind of story. She’s a great icon, as a symbol or as a lunchbox logo. She’s even a great character, with an inner strength, capacity for compassion, and warrior spirit with the skills to match. But as a STORY ENGINE? She is a complete cypher. At least James Bond has a story engine, however generic. Hmm… Making the most of your potential. Fighting back against the darkness. Well, power and responsibility, of COURSE. Yes, and Wonder Woman? … Well? I’m waiting… See? No story engine. I would LOVE to watch a Wonder Woman movie, and yes my darling, really ANY superhero movie, that shows a story-engine kind of understanding of its character. You can do that in an origin story, a sequel, a TV spinoff, whatever. OK, so, what we need is a Story Engine that is the best expression of a uniquely Wonder Woman metaphorical theme. Not so easy, I’m afraid. There’s no, one, go-to story that helps define Wonder Woman’s thematic core, her very resonance. So let’s pick one and enhance it. For Wonder Woman, her theme is “Together, we are strong.” It’s about brother/sisterhood. Unity. Family. What’s so wonderful is that it stems from her defining characteristics of compassion and determination. It showcases her as a guardian, a leader, but one never far removed from community. You see? Even very famous story arcs of Wonder Woman’s can be presented very nicely through this lens. In the War of the Gods (yes, it’s 1991, but still…) triumph is earned by all mythologies banding together with Wonder Woman, do they not? Ah! 20 year-old spoilers, pardon! In Paradise Lost (ten years later in 2001), she wins the day by dissolving the concept of the “royal family” of Paradise Island, unifying her mother and her people. In her current “New 52” version? She is brought into the family of Greek demigods, surviving her trials by standing up for others and banding together with her new family. And then it’s only natural to see a string of villains and save-the-world plots happening. Obviously, her archenemy Ares would be opposed to the themes of unity, as would Circe. Other villains that represent selfishness, division, or subjugation, like, say, Cheetah, Eris/Discord, or Maxwell Lord or Dr. Psycho, have stories that practically beg to be told through this lens! Wow! Okay, hold on. This all started from the idea of one movie! So what’s your pitch? Ah! Well, I was getting to that, you impatient, little, chubby-cheek, you. Start with a cold open, like any good James Bond story, and Wonder Woman with a team of Amazons fight off some monster-headed creature things. But what seems like some exotic location is in fact South Dakota or something, and we learn how popular Wonder Woman is as an iconic, if somewhat distant, near-celebrity. Back on Paradise Island, Wonder Woman learns that one of the Amazon’s prisoners, Cheetah, has escaped during Diana’s excursion to Earth. Wonder Woman makes the choice to go after Cheetah, who’s trying to hunt down Steve Trevor, among other military agents. Trevor, you see, knows the location of a magical place of power, because a black ops that went bad, naturally. Wonder Woman and Trevor team up to investigate, and find Cheetah is connected to Circe, the sorceress with a penchant for transforming people into animals (movie origin alert!). The place of power would also allow Circe to sever Paradise Island’s connection to Earth, and Wonder Woman is stopped from an early victory by rebel Amazons who have pledged allegiance to Circe and would like nothing but to see such separation. Will Wonder Woman be forced to sacrifice Paradise Island and be trapped on Earth? What will the showdown between Diana and Circe look like? Will Circe show Wonder Woman’s “true face” of humanity, as beasts, opposed to Diana’s hopefulness and optimism? Don’t worry, mon chere, goodness and unity are victors in the end. Together we are strong, after all! Vera, I thought you would go bigger budget than that! I see. Well, you could have Circe release the Titans of myth upon the world, I suppose. That worked for Disney’s Hercules. But, really, darling, such monies would be better spent on putting some young ingenue in Cheetah body-painting makeup. Come to think of that, show that to the movie executives, and that might be all you need to get a Wonder Woman movie in development. Hmm. How droll. C’est le Hollywood, I suppose! Thanks, Vera, for keeping it real. I’m ever as real, as real can ever be. What’s one female Marvel Comics’ hero that deserves icon status? I’m not sure if Captain Marvel can suffice, but she’s a great candidate. Before she changed into her current Captain Marvel duds, I, like most, was getting a little bit tired of Ms. Marvel’s classic costume, but at the same time I really admired it for its simplicity. I tried to draw my own take, with the challenge to be reminiscent of the ol’ black-and-yellow but to re-imagine a new costume that could help make Carol Danvers looking like an archetypical capital-H HERO. For this design I was trying to push the Falcon into more of a traditionally “heroic” mode, in both costume and modus operandi. I would love to see Falcon standing tall on a darkened building, listening intently into the night, with a dramatic cape fluttering in the night air. He is kind of a Superman at heart with a Batman powerset in a Spider-Man setting. If that ain’t intriguing enough, you gotta read more comic books! And with such a focus, a different costume might be needed. Here’s a quick sketch with a splash of color, but I didn’t have enough time to really the cape as I would have liked. 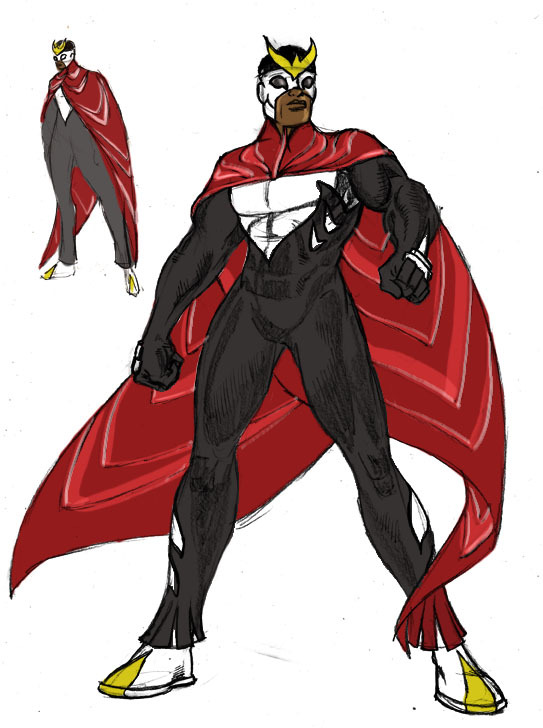 In other words, the cape doubles as wings by overlaying electricity/hard light over them, and his usually-open mask now has bird-of-prey googles in the design. I figure, if you’re going to go superhero, then go big. The days of paramilitary fatigues and padded jackets/jumpsuits are over. Let’s go back to sleek, iconic, and sporty, appropriate for an idealistic do-gooder like Falcon!